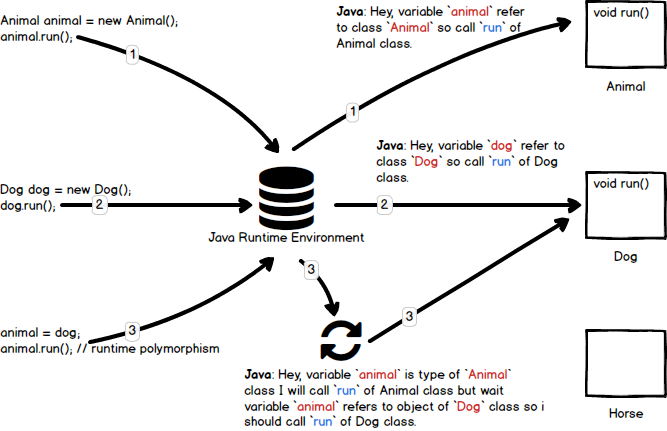 Java by examples: What is runtime polymorphism in Java? One way you can achieve Runtime polymorphism in java is by Method Overiding. Lets check the code followed by explanation. * Example demonstrate Runtime Polymorphism. * It will call referenced object's `run()` method. * In this case, object of `Dog` class is referred. * In this case, object of `Cat` class is referred. * from the super-class `Animal#run` will be called.